All calculations here are based on the ISO 10211 methods and default values / boundaries. The PSI-Value is just the difference between the actual heat loss (from the 2D simulation) vs. the assumed / predicted heat loss from the 1D U-Factor method. 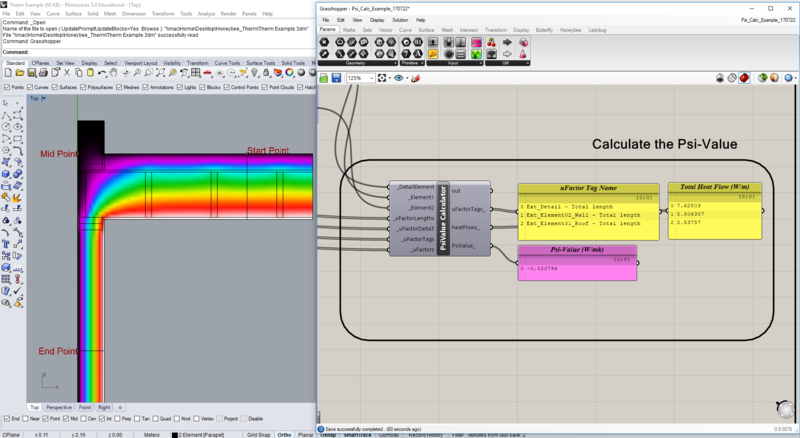 All calculations here assume using EXTERIOR dimensions for the U-Factor clearfield 1D heat flow. In order to get the calculator to work, you just need to hook it up to the standard ‘readTHERM’ Honeybee component and a few additional inputs which describe the 2D ‘Idealized’ lengths. I did that by just inputing 3 reference points which works for most situations but certainly there are lots of ways this could be done. I didn’t do a ground calculator - this only works for ambient air situations. All the simulations are using ISO 10211 default temps (20°C interior, 0°C exterior) but it should work with whatever temps you input. A plan-cut of a 2x6 stud wall turning a corner. These ‘geometric’ thermal bridges typically yield a ‘negative’ Psi-Value when using exterior dimensions for the clear field inputs. This example shows a Psi Value of -0.036137 W/mk which is as expected. This one shows an example of a section cut through a typical wall-to-flat-roof / parapet detail where the exterior BC length is very different and irregular. As with the rest this method assumes ‘exterior dimensions’ for the inputs and Psi-Calc. As with the other 2-Element example, inverted junctions will typically yield a negative Psi-Value when using exterior dimension references. This one calculates to -0.020796 W/mk. anyway, I just thought someone might find those components useful or of interest. Note that I don’t think E+ can accept the ‘negative’ Psi-Values (might be wrong about that?). 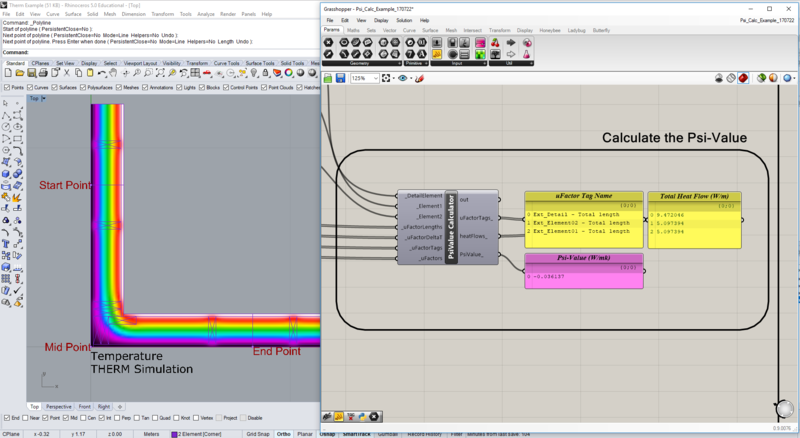 But if you are using a program like PHPP or WUFI you can input those negative values to take credit for the reduced heat flow at those inverted junctions. Also - be sure to set your ‘Units’ tolerance in Rhino to 0.0001 before opening the .GH attached file here to make sure you don’t get any errors. There’s a lot of great stuff here and thanks for sharing. I am not nearly as familiar with the methods for calculating Psi values as they rarely get used over here in the US. Your post and you example here helped me understand a lot more about how these values are calculated and I learned several things. For one, I didn’t realize that the idealized construction that the thermally bridged construction was being compared to could also have thermal bridges within it. There are definitely some changes to the Honeybee Therm components that should be made as a result of this. If you want to try to add this into the component yourself @edpmay , I will gladly accept a github pull request from you with this addition to the Honeybee components (and then you will get credit as a contributor on the github). Otherwise, I can add this code in and just credit you for the addition at the top of the “Read THERM Result” component. Secondly, It seems valuable to have your component that calculates the Psi value and total heat flow as a part of Honeybee but I feel that there may be more elegant ways of doing it. Can you think of any cases where we would not have the element length from the BC length and so we would not have to use the two points to define the length? Or is the idea that the element lengths are supposed to be projected into a specific plane for the simulation? Thanks again for doing this @edpmay ! I’ve already learned a lot. @edpmay This is fantastic work, thank you for sharing! Although after opening the attached GH file, I’m finding the error “Solution exception:WindowsError” from the WriteTHERM component. Any idea as to why this might be happening. I have THERM v7.6 installed on my PC, and haven’t had this error in previous THERM workflows. Just change the name of the workingDir and the fileName on the “Write THERM File” component. You probably just don’t have those folder locations on your computer or you don’t have permission to write to that location. Thanks guys - I’m glad to you thought this was interesting and I hope its helpful to folks. Yeah unfortunately in the states there are very few good guides for calculating Psi-Values and its not addressed much outside some pretty specialist disciplines. It was only really once we started doing projects to European certification systems such as ‘Passive House’ that we began to wrestle with these calculations more. Even so, there are really not a lot of good resources for understanding the protocols and calculation procedures for these - so its taken us a while to sift through the ISO standards and examples try and understand the rules. 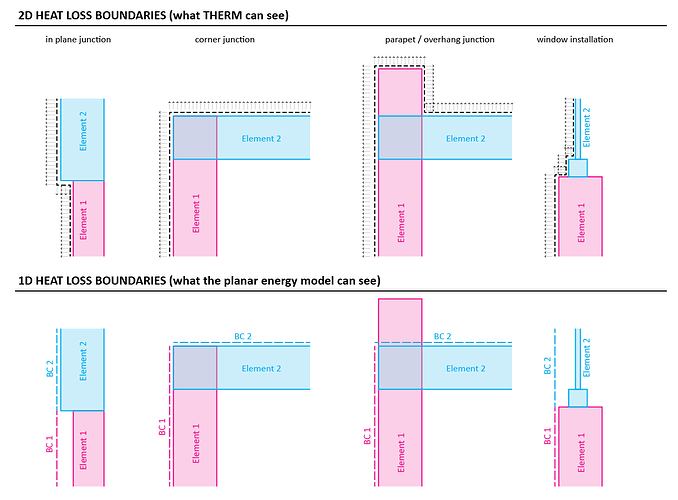 I think that part of the confusion as well is that those of us in the building performance industry often talk about ‘Thermal Bridges’ and ‘Psi-Values’ as though they are the same thing when in reality the TB is a general concept and the Psi is better thought of as a ‘correction factor’ for the simplified planar energy-model which is used to more accurately account for the heat flow at complex intersections and junctions of the actual construction. I think they give a reasonably good overview of the PSI-value calculation process for most basic situations. I’ve only posted parts 1 and 2 for now (we have a ‘part-3’ built that shows the ground methods but those calcs are super weird and its taking us a little longer to distill those down into something understandable / presentable). I think that for the first or second types that yes, the relevant info could likely all be pulled from the U-Factor file and the Psi-Value calculated automatically. But I think that for the second two types I’m not quite sure how to get the calculator to know which elements are which automatically and where they intersect. Actually I guess I could imagine a few scenarios where this would be possible - but they’d all involve the user tagging / inputting the data in a few particular manner and so I’m not sure how flexible and resilient that would be in practice. But I’ll think about it more and try out a couple methods and post here. I definitely agree that making it more flexible / automatic would be important. Yes if you think this would be helpful to integrate into the HB tools I’d be happy to work more on the overall workflow and try and reduce down the steps / streamline and automate it more. 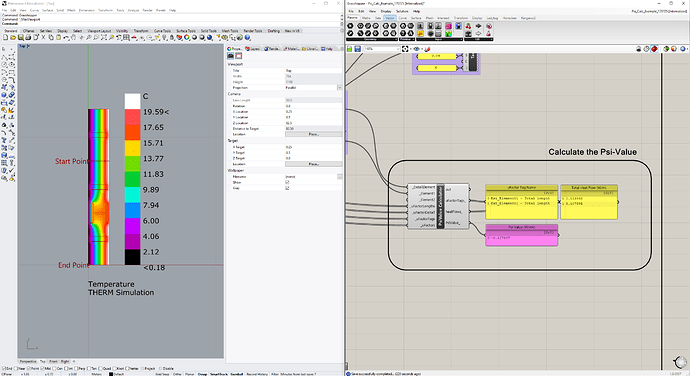 If you are able to add the UFactorLenghths and DeltaT to the basic ‘readTHERM’ that would be a great first step. For the editing of the ‘readTHERM’ component - I think it would probably be best if you edited it rather than me doing that: I’m not really a ‘code’ guy but rather more on the building-science side - I certainly enjoy messing around with writing code to add/expand but I wouldn’t want to accidentally break anything in there in the real component. changed 4 files with 52 additions and 13 deletions. I also decided to bring in all of the tags even when the BC length is 0 and the UFactor is NaN since this will make it easier to write scripts to process the results (since the first UFactor in the list will always be the Total Length, the second will always be Projected X, etc.). At the least, this will save you from having to manually select each UFactorTag out of the list in your result post-processing. In an ideal scenario, I hope that it also means that you might be able to use the projected X and projected Y U-factors in a Psi value component instead of having to manually put in points but I realize there may be a few steps to figuring out how to do this. changed 2 files with 1 additions and 1 deletions. Let me know if you get the chance to post an updated Psi value component now that we have these changes. As I said, we’d be happy to have it as a part of Honeybee. Oh, and @jwoodall , I added a check to the THERM simulation component, which should decrease the probability of you seeing the WindowsError. I have realized the latest versions of THERM seem to be locking the thmx file somehow, which cases errors when you re-run the component. The check in the component should catch these situations now. These calculations will produce linear thermal bridge heat loss values (in W/mk) which can then be applied to an energy model such as through the Honeybee E+ tools. Here is a question I’m thinking about for a long time. 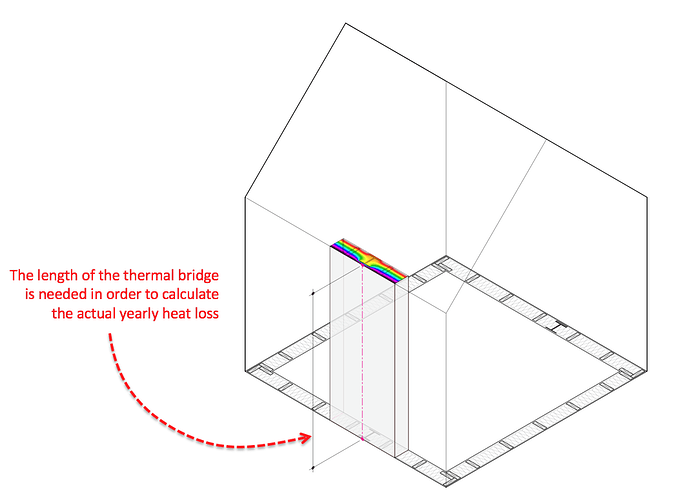 How are thermal bridges taken into account in HoneyBee and how can we set them in HoneyBee Tools ? I always specify these values in other softwares (DesignBuilder, Ecotect, …). And not knowing how this works here keeps me from using HB completely. @chris that is fantastic, thanks! - I’ll take a look at the updated component structure and see how I can revise the Psi-Calculator portion to work more effectively / automatically and will post an update. Anyway, I’ll try and add an implementation of folding these Psi-Values into an E+ mode to a more complete example file once I have the Psi-Value calculator working better and I’ll add that here for your thoughts. How are thermal bridges taken into account in HoneyBee and how can we set them in HoneyBee Tools ? Thank you @mostapha and @edpmay, this is really helpful ! I’m trying to learn Ladybug and Honeybee in depth, just started a while ago - this is my first post here. In the first example you posted, there is a Psi value of +0.20737 W/mK (the simple stud wall). I’m evaluating your script, and noticed, that for me it is -0.127697 W/mK. The heat flow is also different in the first line for the detailed 2D simulation. I’m in the process of learning the underlying physics as well, so I would like to make sure that I can follow along the examples posted here and Hydra, and troubleshoot when I see differences like this. 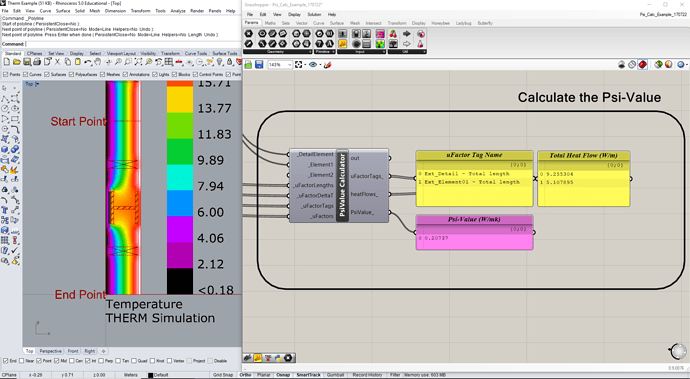 I was also having the “WindowsError” with the writeTHERM component, which I managed to resolve - changed all the working directories to mine, changed the unit tolerances to the required 0.00001, set the “Save Conrad results file (.O)” in the THERM simulation preferences. It didn’t work. So I’ve quit Rhino and Grasshopper and started it again as admin, this time it worked. Please bear with me, I’m getting used to Windows again, feels like I’m shooting in the dark, I’m not yet confident what I’m doing. I hope you can find the time to explain my questions. All the best and thank you for all these valuable resources! if you change that to 'Ext_Detail - Total Length" you should get the same answer as I show in the above description. When I get a chance I’ll try a post an update to this workflow / component and make all more ‘automatic’ and flexible and hopefully I can find a nice way to remove that entire ‘reference length’ input section. Let me know if you still can’t get the same answer there though once you update that reference length.